How are you doing with your New Year’s resolutions? Did you have any? Let me share mine with you. Last year, my New Year’s resolution was to quit sugar. I had been addicted to sugar for over 31 years, and I knew it was time to stop. I tell everyone that my staying away from sugar for the whole year was miraculous, but the truth is, I would have never made it without all the healthy snacks I learned to make along the way. Dates filled with nut butters and unsweetened chocolate, chia puddings, and baked apples with spices and yogurt became my staple sweet snacks, and I will forever be grateful to them for helping me stay on the sugar-free path for this long…and hopefully forever. This year, I decided to go deeper in my path to health and try to stay off gluten for a whole month to see how I felt. I’ve spent the last 12 months studying to become a holistic health coach, and through my experimenting with different ways of eating I’ve come to suspect I may have a sensitivity to gluten. Naturally, I thought the new year was the perfect time to cut it out of my diet for a while, and once more I relied on healthy snacking to keep it up. You see, New Year’s resolutions are easy to make but difficult to maintain unless you have a plan to help you make the lasting changes you desire. Changing is certainly possible, but you have to be smart about it. Today I’m sharing one of the gluten free and processed sugar free treats that have helped me stick to my New Year’s resolution. These muffins are made with cooked quinoa, almond flour, and rice flour, and I sweetened them with raw honey and dried plums. I try to use fresh or dried fruits as sweeteners as often as possible, because they’re delicious and very nutritious too. They are also incredibly high in fiber, which is good for a healthy digestive system and for your heart’s health. 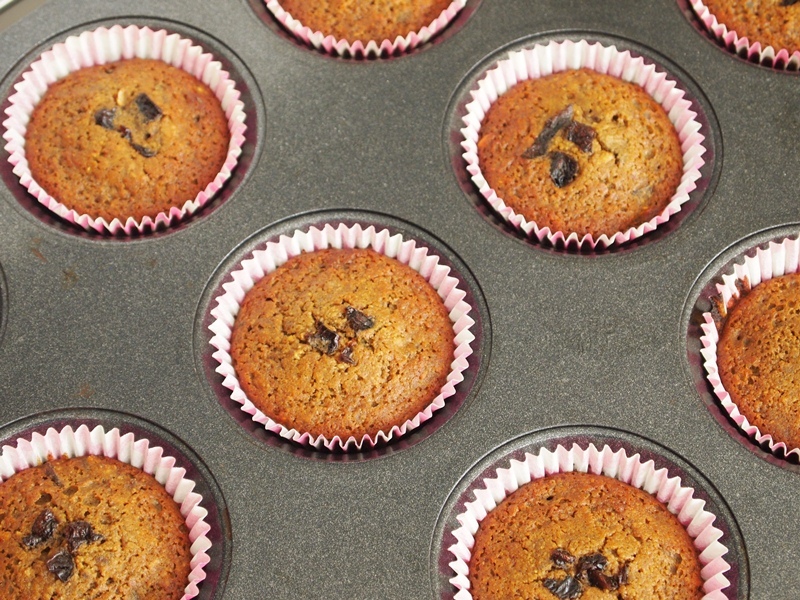 To make these tasty muffins I used Sunsweet Amaz!in Plums which are ideal whenever you need to add a sweet touch to any recipe, as they will satisfy you while having a low glycemic index at the same time (that means they don’t raise your blood sugar levels and you feel fuller for longer). 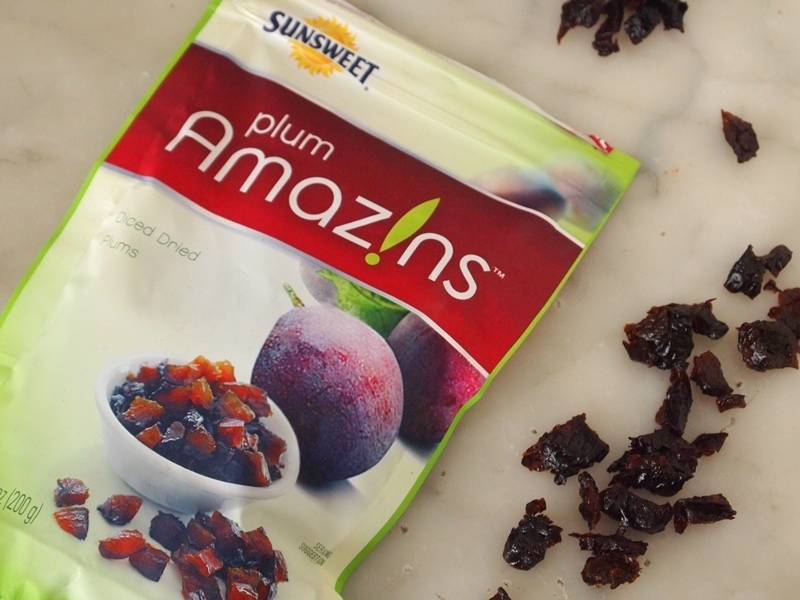 My favorite thing about this product is that the plums are already chopped, saving you tons of time as you can add them straight from the bag to your bowl. And if you don’t have time to make a snack, you can simply grab a handful and enjoy them on their own. If you have resolved to eat healthier in the New Year like I have, and you focus on keeping healthy snacks like these wholesome muffins at hand, it will be much, much easier for you to succeed. Now you know it. Preheat the oven to 375°F. 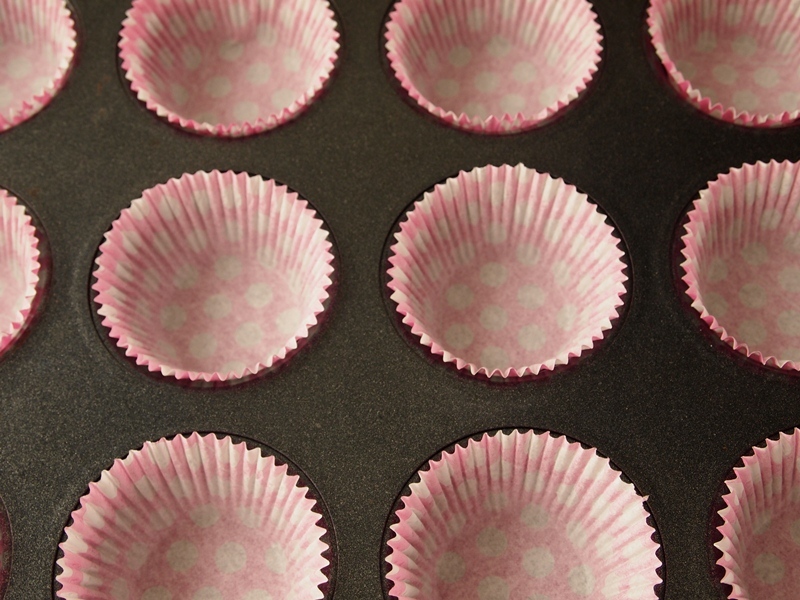 Line a 12 cup muffin tin with paper cups. Combine almond meal, rice flour, baking powder, and salt. In a small bowl combine quinoa, almond milk, and vanilla. 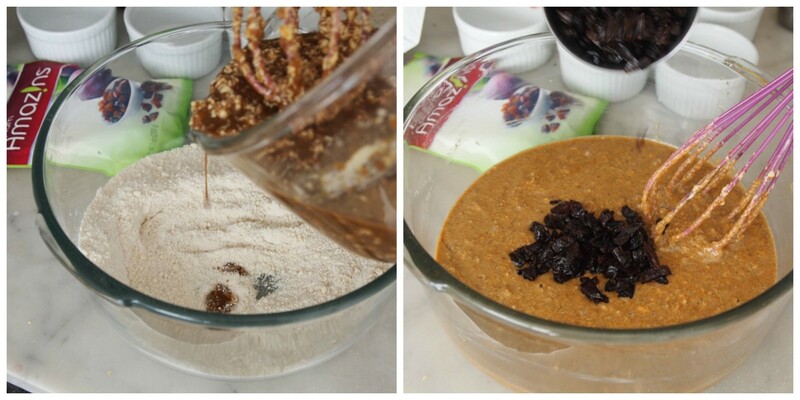 In another bowl mix the almond butter, honey, and egg, using a wire whisk or a hand-held mixer. Stir in the quinoa mixture with a spatula. Add to the almond flour mixture, together with a cup of chopped plums. 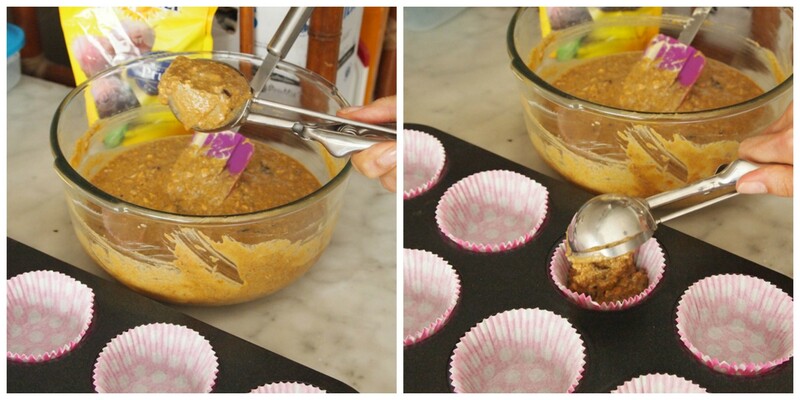 Pour the mixture into the muffin tins, filling up to two thirds of each paper cup. Sprinkle with the remaining plums. Bake in the preheated oven for 25 minutes or until the tip of a knife inserted in the center of each muffin comes out clean. Gluten-free Quinoa and Pichuberry Muffins #SweetFridays – Easiest quinoa chocolate muffins ever Chocolate and Maca Mousse – 100% Tasty and Sugar-free! Do you have the sugar content for this recipe?? Hi Mariana. 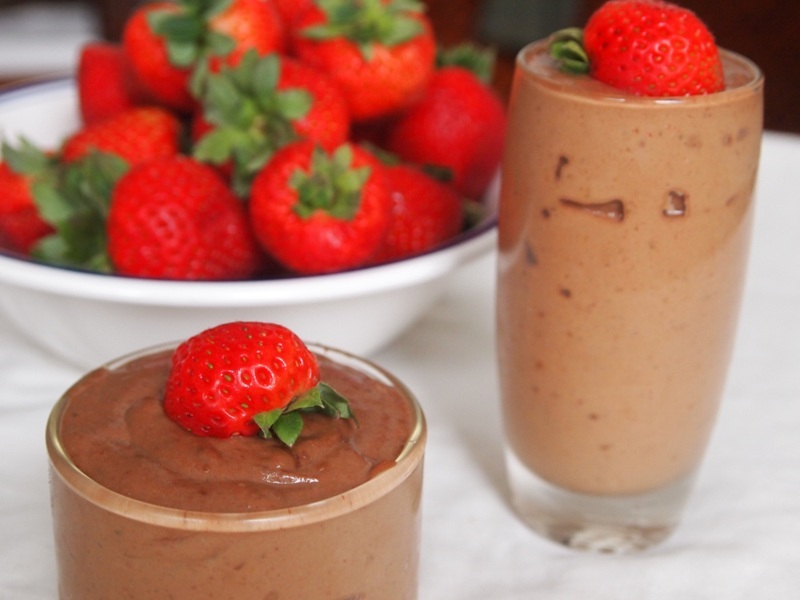 This recipe is sugar free, that´s why there is no sugar in the ingredient list, only honey. You can substitute the honey with 1/2 cup brown sugar. I just made this recipe and I absolutely love it. I cane hone from work and I was craving a Starbucks butter croissant as I always do when I come home. However,i discovered your website while at work and could not believe it when you said you had gone sugar free for a year. That thought stayed with me as I drove to Starbucks, yet, on the way there, i decided to turn around and go to the grocery store instead. Once there, i bought all the ingredients for this recipe and went home and made the cupcakes. In my opinion they are better than any other pastry i have ever craved. Thank you for sharing this with us. Thanks, Jeniffer! We love this story. Hi there! 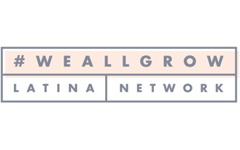 As a venezuelan living in Perú i just can say that you are doing a great job in this website. I just love Perú and its food. I am a software engineer but i have felt so much in love with this beautiful country’s cuisine ( and its people and so many other things) that i decided to register myself at a local gastronomy school. But i’m not here to talk about myself (excuse me please). Just keep the great and inspiring work. And how are the cooking classes so far? I hope you´re having a great time! Thanks for visiting and for your nice words.